The force named the four children, who have not been formally identified, as Riley Holt, eight, Keegan Unitt, six, Tilly Rose Unitt, four, and Olly Unitt, three. Their two-year-old brother Jack survived, along with mother Natalie Unitt, 24 and her partner Chris Moulton, 28. Part of the roof collapsed, windows were shattered and rooms left blackened by the blaze after the fire broke out on Sycamore Lane at about 02:40 GMT. Neighbour Wendy Pickering said she heard “screaming” in the middle of the night, while her husband Bryan said he was alerted to the fire by his dog barking during the night. Firefighters confirmed that a man, woman and young child had escaped from a first-floor window before emergency services arrives. She described Riley as a “confident, excitable” and articulate boy “who was always keen to ask lots of questions. Tilly, meanwhile “was a happy little girl who loved coming to nursery” and was “a friendly and caring child who loved to read stories, dress up and paint”, Ms Glover said. She said Olly was “a happy, loving boy who loved cuddles. He was always happy to come to nursery and loved to be in the role play area with the dolls”. 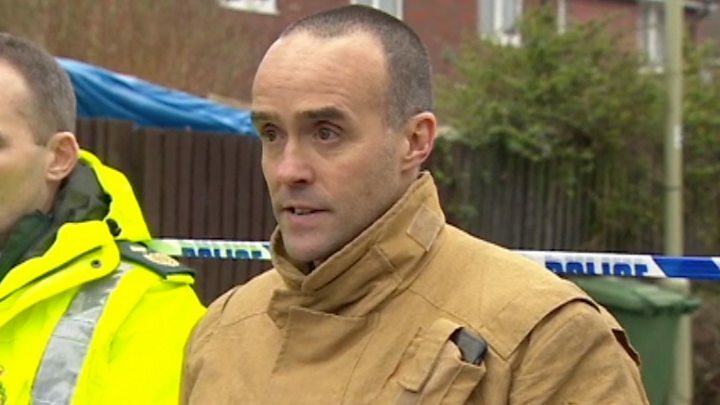 Ch Insp John Owen, of Staffordshire Police, described the blaze as “absolutely heartbreaking”. “Our firefighters were faced with very difficult conditions inside the property due to the severity of the fire,” he said. Nathan Hudson, assistant chief officer of West Midlands Ambulance, added: “This was an immensely difficult incident for all three (emergency) services to respond to. County councillor for Stafford West, Carolyn Trowbridge, said local people had already begun to collect items and money to help the family. There was a special service at Castle Church in Stafford at 19:00 GMT. The Rev Philip Sowerbutts said: “It will take this community a long time to get over such devastation. A donation page set up to help the family “rebuild their lives” has amassed more than £12,000 since it was launched. Its founder, Stephen Glover, whose daughter attended the same school as Riley Holt, said he was “delighted” at the generosity of people not only from Stafford but all over the country. Housing association Stafford and Rural Homes, which owns the property, said it was assisting the police and fire service with investigations.